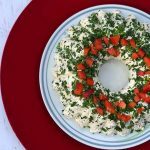 Use a 6-inch Bundt pan to make your cheese ball look like a holiday wreath. Tear off two 16-inch pieces of plastic wrap. Place them on the counter and overlap them lengthwise by a few inches. Line a 6-inch Bundt pan with the plastic wrap, making sure all interior surfaces are covered. In a food processor, combine the cream cheese, cheddar, Worcestershire sauce, jalapeño peppers (if using), and black pepper. Pulse until well combined. Spoon the cheese mixture into the Bundt pan and pack it in tightly. Fold the wrap over to cover all of the cheese. Refrigerate at least 1 hour. Unwrap the top of the pan and invert onto a serving plate. Cover the wreath with the parsley and chives, then sprinkle the red peppers on top. Nutritional information does not include crackers or vegetable dippers.